Falkland Islands, an archipelago in the South Atlantic Ocean located 290 miles from mainland South America consists of two main islands (East Falkland and West Falkland) and 776 lesser islands. It has a total land area of 4700 square miles and a population slightly above 3000. In spite of the ongoing sovereignty dispute between Argentina and United Kingdom over the island tourism has continued to flourish. The main industries of the place are agriculture, sale of fishing licenses, coins and stamps sale to collectors, sheep farming and tourism. The best time to visit these pristine and remote islands is from September through April with the peak being between November and February. It is a place that is constantly on the radar of nature enthusiasts and wildlife photographers. The major attractions are Antarctic wildlife viewing, and bird watching. The capital Stanley is a very charming, colorful place with museums, cathedrals and other points of interest. Ample opportunity for biking, hiking and golfing exists. It is also common for visitors to avail of the services provided by tour operators. Falkland Islands: The Bradt Travel Guide 978-1841620374 $15 Covers Port Stanley, East Falkland, West Falkland, Sea Lion Island, Pebble Island, Carcass, Westpoint and New Island, Saunders Island and Keppel Island, Weddell, Staats and Beaver Islands along with selected flora and fauna. 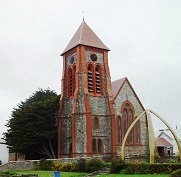 Please note that the official Falkland guide comes free for visitors and so this one is useful to plan a trip as the free guide is pretty good once you are there. The first stamps of Falkland Islands were a set of four stamps released between 1878 and 1879 showing a portrait of Queen Victoria. The set (Scott #1 to #4) is very valuable. Scott #2 (4p dark gray) is the rarest of the lot and that catalogs for $1300 Mint and $200 used. Interestingly, for the other three issues, catalog value increases in descending order with the denomination. The highest denomination Scott #4 (1sh blister brown) is the cheapest at $75 with Scott #1 (1p claret) fetching $775 Mint and $500 used. A number of varieties of the same theme in different denominations were the only stamp issued of Falkland Islands until the turn of the century. Some of them fetch a big premium in the hundreds while others can be had for tens of dollars. The most valuable stamps during this period are bisects and unsevered pairs of 1p varieties. The bisects fetch in the hundreds while unsevered pairs in the thousands. The QVs were replaced by King Edward VII (KEVII) theme in 1904 and King George V (KGV) theme in 1912. Those sets are also very valuable with the former (Scott #22 to #29) fetching in the $500 range and the latter (Scott #30 to #40) in the $1000 range. A couple of other KGV sets formed the Falkland stamp issues till 1933. Those sets (Scott #41 to #48 and #54 to #64) are also pretty valuable fetching in the few hundreds of dollars. A surcharged variety on the 2p brown violet is the most valuable stamp during the period fetching in the $1000 range – genuine double surcharges on this stamp can fetch as high as $40K. Falkland Islands released a long set of twelve stamps on January 2, 1933 in the historical theme to mark the centenary of the permanent occupation of the islands as a British colony. The beautiful set (Scott #65 to #76) is sought after and fetch a huge premium cataloging for $3500 MNH and $4500 used. The designs show Romney Marsh Ram, iceberg, whaling ship, Port Louis, Map of the Islands, South Georgia, blue whale, Government House, Battle Memorial, penguin, Coat of Arms, and a portrait of KGV. This was followed by another important set of sixteen stamps in the ‘Local Scenes’ theme during the period from 1938 to 1946. The set (Scott #84 to #96) catalogs for around $460 MNH and $200 used. The designs show Whale Jawbones, black-necked swan, Battle Memorial, flock of sheep, upland goose, R.R.S. Discovery II, R.R.S. William Scoresby, sugar top, turkey vultures, gentoo penguins, sea lions, Deception Island, and Arms of Colony. The Whale Jawbones depicted in the first stamp is the one at Christ Church Cathedral, which is one of the most photographed items at Port Stanley – it is an archway standing 20 feet tall made from the jaw bones of two blue whales. A set of four stamps released on December 8, 1964 to mark the 50th anniversary of the Battle of the Falkland Islands during World War I. The set (Scott #150 to #153) is fairly inexpensive and catalogs for around $10 MNH and $6 used. The designs show H.M.S. Glasgow, H.M.S. Kent, H.M.S. Invincible, and Falkland Islands Battle Memorial. The set was made famous in the early 70s with the discovery of the Glasgow Vignette error on the 6p blue (Scott #151). The error variety (Scott #151a) shows “Glasgow” in the Vignette inscription instead of “Kent”. That stamp is extremely valuable as only one sheet is known to exist with that error – recent valuations have gone into the $25K range. A set of four stamps released on March 6, 1974 in the Tourism theme. The set (Scott #227 to #230) catalogs for around $30 MNH and $7 used. The designs show fur seals, trout fishing, rockhopper penguins, and military starling (long-tailed meadowlark). A set of fifteen stamps released on July 14, 1998 in the Birds theme. The set (Scott #695 to #709) catalogs for around $50 MNH or used. The designs show tawny-throated dotterel, Hudsonian godwit, eared dove, great grebe, roseate spoonbill, southern lapwing, buff-necked ibis, astral parakeet, ashy-headed goose, American kestrel, red-legged shag, red shoveler, red-fronted coot, Chilean flamingo, and fork-tailed flycatcher. A sister set of thirteen stamps (Scott #830 to #841 and C1) was released on July 21, 2003. That set is also sought after and catalogs for around $45 MNH or used. The designs show Chiloe widgeon, dolphin gull, Falkland flightless steamer duck, black-throated finch, white-tufted grebe, rufous-chested dotterel, upland goose, dark-faced ground-tyrant, black-crowned night heron, red-backed hawk, black-necked swan, and short-eared owl. A set of four semi-postals released on June 14, 1992 to mark the tenth anniversary of the liberation of Falkland Islands. The set (Scott #B2 to #B5) catalogs for around $7 MNH or used. The designs show San Carlos Cemetery, War Memorial at Port Stanley, South Atlantic Medal, and Government House of Port Stanley. The surtax benefited the Soldiers’, Sailors’ and Airmen’s Families Association. Falkland Islands started issuing its own coins in 1974. There are circulation coins along with special commemorative coins with low mintage aimed at collectors. Gold coins with low mintage such as the 1987 One Pound Coat of Arms, 1997 Two Pounds Henry VIII, 1998 Two Pounds Queen Mother, and the 2007 Fifty Pence 20th Anniversary of Liberation trade at a very good premium over bullion value. Coins $1 and up Recent pennies in BU starts around $1. Copper-Nickel UNCs from the 1980s onward starts around $10. Proof sets from the 1980s onward starts around $30. Commemorative silver proofs starts around $50. Gold coins go well into the 100s. Paper Money $10 and up UNCs from the 1970s onward starts around $10. High Value UNCs (50 pounds) starts around $50. Specimen sets go well into the 100s. Genuine Falkland wool garments are a unique and useful buy from the islands. Stamps, coins and first-day covers are sought-after by collectors around the world. Militaria $3 and up Vintage Malvinas magazine from the Falkland War period start around $3 and can go as high as $25. Other commemorative Falkland war memorabilia start around $30. Original medals and equipment start in the 100s. Art $10 and up 19th century maps and historic photos start around $10.